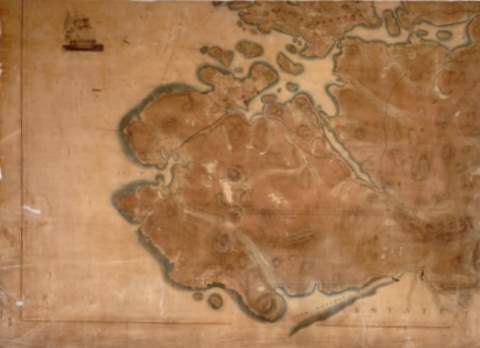 The above map of Uig forms part of a larger map of Lewis and Harris created by James Chapman in 1817. The map is very detailed and currently hangs in the Comhairle building on Sandwick Road, Stornoway. There is a lot of activity going on in Uig over the next few days with the return of the Lewis Chessmen and a Doors Open Day at Baile na Cille church. Baile na Cille church will be open tomorrow and on Tuesday from 11am-4pm, providing a last chance to see the building in its original state before renovation works takes place by its new owners. 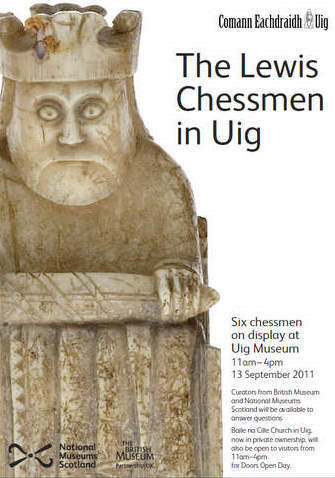 The Chessmen’s return is also on Tuesday with six pieces on display in the Uig Museum from 11.30am-4pm. There will even be an opportunity to win your own replica Berserker! If you can’t make it over to Uig on Tuesday, be sure to catch the Chessmen over the weekend before they leave! A programme of poetry and music will give them a great send off from 5pm on Monday, with clarsach playing from Daisy Nash and Gaelic singing from Mischa Macpherson. Don’t miss it! This entry was posted in Uncategorized and tagged Doors Open Day, Friday Photo, Lewis Chessmen, Uig. Bookmark the permalink.